Departure from Hotel Giò at 9.00. Short stop in Corciano, a medieval village on a gentle hill between Perugia and Trasimeno Lake. From its walls the visitor may enjoy a delightful and vast view of the surrounding hills. The village, included among the most beautiful villages in Italy, is rich in works of art, among which stands out the Church of Santa Maria Assunta, that preserves a painting made by Il Perugino. 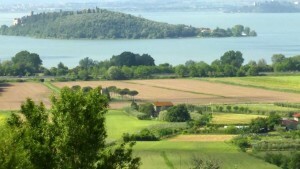 The trip will continue with an excursion to Isola Maggiore, one of the island of Trasimeno Lake. The ferry boat leaves from Tuoro sul Trasimeno, a village famous worldwide for having been a scene of an important battle in the Second Punic War, when the Carthaginians, lead by Hannibal, defeated the Roman army. This place is today an outdoor museum. The Isola Maggiore is the only inhabited island in Trasimeno Lake and it has been famous for fishing and for the work of laces and crochet. Tour of the island and lunch in a local restaurant. Etruscan Arch: monumental city gate of the Etruscan time, extremely well preserved. After the guided tour, free time for individual activity or shopping in the centre. Return to the hotel at 18.30/19.00. Departure from Hotel Giò at 9.00. 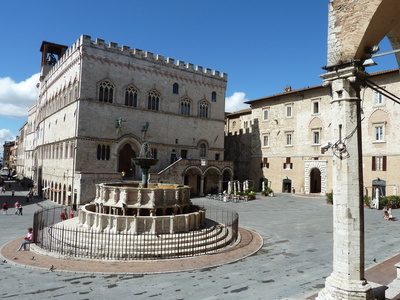 Piazza del Comune (Municipal Square) where grandiose and elegant civic buildings of the Middle Age are located, as Palazzo dei Priori, Palazzo del Capitano del Popolo and Torre del Popolo; there is also an interesting Roman temple named Tempio della Minerva and below the square there are remains of a large Roman public area. Basilica of Saint Francis, that is the centre of Franciscan spirituality and cradle of the medieval European art; it was built over the tomb of the Saint. 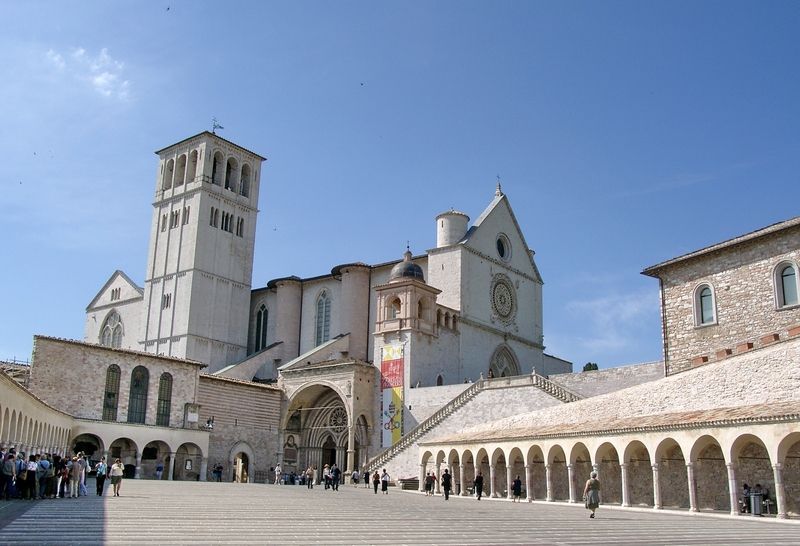 The double papal Basilica founded by Gregory IX, is an architectural masterpiece that embodies the best of Italian art of the Middle Ages, as Cimabue, Giotto, Simone Martini, Pietro Lorenzetti, and others. The cycles of frescos of the Old and New Testament are interwoven with panels on St. Francis’ life, expressing the climax of medieval theology at the time of the full his torical development of the Franciscan order. At the end of the tour transfer to Spoleto for lunch in a local restaurant. 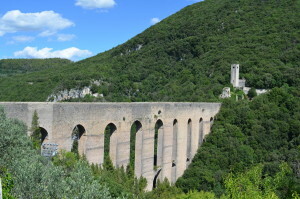 Spoleto has a strategic position overlooking the ancient Via Flaminia. 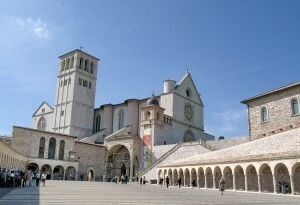 The splendour of its Romanesque churches and the Etruscan and Roman remains attracts many visitors. Albornoz Fortress: it is an imposing military fortress and papal residence over the Flaminia road. In the interior the visitor may enjoy some interesting frescoes about life in courts in the 14th century. 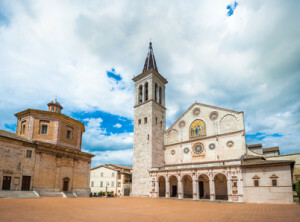 The city tour also includes: the Roman Theatre, still used for performances of the Spoleto Festival, the Triumphal Arch of Druso and the crypt of Saint Ansano, where there are an interesting early Christian crypt with frescoes of 11th and 12th centuries, a medieval church and a Roman temple, one inside the other. Return to the hotel at 18.30 for the farewell dinner.